Flights operate on Monday/Thursday schedule with a shared charter from Arusha. Upon arrival in Arusha take an early morning scheduled flight to Katavi. Transfer by car to your lodge. In the afternoon departure for a game drive. Evening sundowners around campfire. Dinner and overnight at the camp. Katavi is the third largest park covering over 4.470square kilometres. It lies in the remote southwest of the country. It is very hard to reach the park by car, but there are good flight connections from Arusha. Two enormous plains of knee-high golden grass (Chada and Katasunga) dominate the park. Varied woodlands and usually an abundant amount of game surround these grasslands. This is an incredibly wild and rare, untouched area of Africa that offers amazing panoramas. Swamps create the perfect habitat for hippos, elephant, buffalos, zebras and different species of antelope that come to this wet area to drink during the dry season. During the wet season it is also a birdwatcher’s paradise as it hosts more than 400 species of bird. Discover the amazing beauty of this park, taking part at inspiring game drive in the morning, returning to the lodge for brunch/lunch and enjoying the afternoon at leisure. High tea followed by afternoon/ early evening game drive. Evening sundowners around campfire. Dinner and overnight at the camp. After breakfast, depart for a full day game drive with picnic lunch. Return to the lodge late in the afternoon followed by evening sundowners around campfire. Dinner and overnight at the camp. After breakfast transfer to Katavi Airstrip and departure with shared charter flight to Mahale Airstrip. Transfer by dhow boat (1.5 hour) to the lodge where the staff welcome you. Lunch at the lodge followed by an afternoon chimpanzee trekking (should time allow, alternatively short forest walk). Evening sundowners on the beach. Dinner and overnight at the lodge. Mahale Mountain National Park is the least visited park and the hardest to access. A few flights are available from Arusha but not daily. The park is named after the Mahele Mountain range that is within its borders, and it covers just over 1.600 square kilometres of forest, mountain and savannahs. Chimpanzees are the main attraction of the park, but the sightings are not guaranteed as it is not easy to locate them. It’s also possible to see buffalo, elephants, giraffes, lions and the red and Angola pigeons. The park lies on the shore of Lake Tanganyika. A forest lies between the lake and the river creating an incredible landscape. You can find a few lodges on the mountains and on the beautiful beaches of the lake. Many different activities are available such as safari treks dedicated to looking for chimpanzees, boat and kayak safaris and fishing trips. After breakfast you will depart for morning chimpanzee trekking returning to the lodge for lunch for an afternoon at leisure. If time allows there will be early evening chimpanzee trek. Evening sundowners on the beach. Dinner and overnight at the lodge. You will leave after breakfast for a visit to Katumbi local village, school, clinic and general introductions to local fishing. Alternatively proceed with morning chimpanzee trekking. Return to the lodge for lunch for an afternoon at leisure. Evening sundowners on the beach followed by a barbeque dinner on the beach and overnight at the lodge. After breakfast, depart for 1.5 hour transfer by dhow boat to the Mahale Airstrip. Depart with shared charter flight from Mahale to Seronera Airstrip in Serengeti. At arrival transfer to the lodge combined with game drive (if time allows). Staff welcome and introductions, followed by lunch. High tea followed by afternoon / early evening game drive (should time allow). Evening sundowners, dinner and overnight at the lodge. After breakfast, depart for a full day game drive with picnic lunch. Return to the lodge late in the afternoon followed by evening sundowners. Dinner and overnight at the camp. The Serengeti National Park covers over 14.700 sq km and is the largest national park in the country. 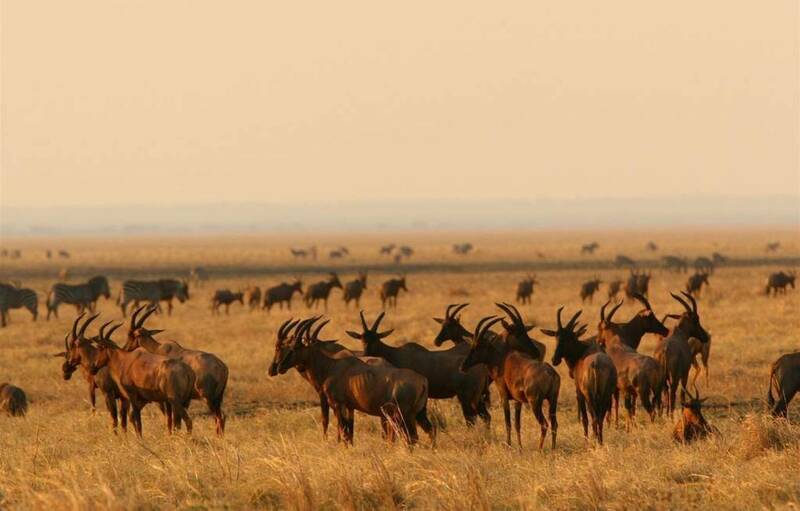 It hosts the largest mammal migration in Africa in which approximately 2 million wildebeests, 1 million zebras and hundreds of thousands of impala and gazelles migrate a distance of over 800 km. These animals migrate throughout the year in search of fresh grazing and higher quality water. The Grumeti and Mara Rivers are the most difficult points in the migration for these animals. Each one, driven by the same ancient rhythm, strives to fulfil its instinctive role within the inescapable circle of life. The result is a three week bout of territorial conquests, mating and survival of the fittest as 40 km long herds of animals plunge through crocodile infested waters and pass through predator territories where hiding lions and other predators wait for one wrong move. The precise timing of the Serengeti wildebeest migration is entirely dependent upon the rainfall patterns each year. The best time of the year is between November and July/August, with the highest intensity occurring between January and February, when the female wildebeests stop in The Ndutu Plains to give birth. The wildebeest migration continues north during the dry season from July/August until October, where the animals complete their annual route. Yet even when migration is quiet, the Serengeti arguably offers the most scintillating game-viewing in Africa. Southern Serengeti is characterised by vast plains, and below the layers of volcanic rock and ash that form the soil of the Serengeti, there is a thick layer of extremely old metamorphic rock. Late in the Precambrian, a giant bubble of liquid granite forced its way up from the liquid layers below the Earth’s crust and into the Tanganyika Shield. Today, as the softer metamorphic rocks of the Shield wear away, the uneven top of the granite layer is exposed, forming the famous kopjes. Kopjes provide protection from grass-fires, more water in the ground around them, holes, cracks, and caves for animals, and a vantage point for hunters of all kinds including lions and, occasionally, cheetahs. The western corridor of the park is covered in swampy savannah with black clay soils. Moving towards Lake Victoria along the Grummet and the Mbalangeti Rivers, the landscape changes again into forests, the ideal habitat for cheetahs. After breakfast you will depart for morning game drive returning to the lodge for lunch for an afternoon at leisure. High tea followed by afternoon / early evening game drive (should time allow). Evening sundowners, dinner and overnight at the lodge. Evening sundowners, dinner and overnight at the lodge. After breakfast you will depart with vehicle transfer to the Seronera Airstrip combined with game drive (should time allow). Depart with shared charter Flight from Seronera to Arusha with packed lunch.